Vis-à-vis the Switching Labyrinth over on BLDGBLOG, here's a recently published paper on a largely ignored aspect of crowd behavior: the need to socialize. Most current models of crowd displacement assume the individuals to act independently, simply trying to reach their destination without collisions. 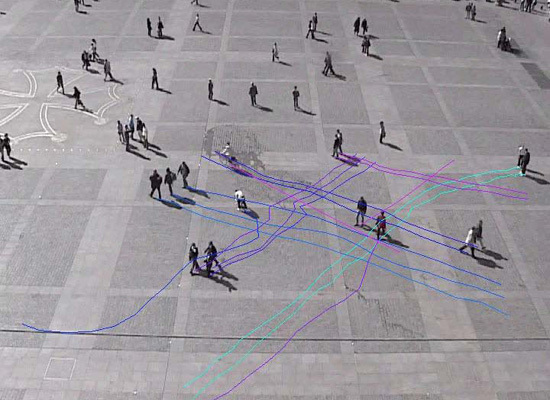 Using video recordings in urban areas, the team of Guy Theraulaz (Research Center on Animal Cognition, CRCA, University of Toulouse/CNRS), in a straight collaboration with Dirk Helbing of the Swiss Federal Institute of Technology in Zürich, showed the 50 to 70% of pedestrians do not move alone but in small groups of 2 to 4 people. 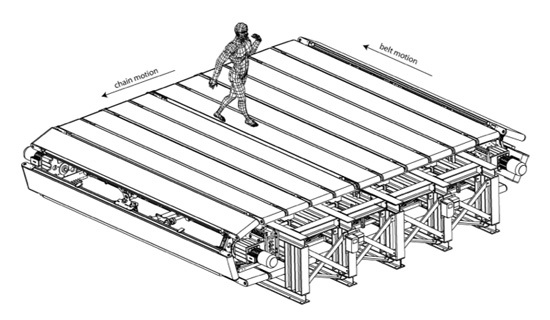 The study of the spatial organisation within these groups reveals that they walk side by side as long as space allows it, but switch to more complex shapes when crowding increases, with the central persons waking behind the others. This leads ot V shapes in groups of three and U shapes in groups of 4. While these configurations facilitate the communication within the group, they slow down the whole group speed. These concave configurations simply make straight walking ahead more tedious and complicate avoidance manoeuvres. On the whole crowd scale this leads to a roughly 17% traffic reduction compared to a situation where pedestrians move independently. As with many efforts to understand how crowds behave in urban environments, how they are affected, for instance, by bottlenecked entrances, dueling streams of pedestrian traffic and “turbulence” in shoulder-to-shoulder mobs, this new model of crowd dynamics will help urban planners develop safer and more flock-friendly public spaces. Not quite related but somehow we're compelled to twin it with the above is the CyberWalk. 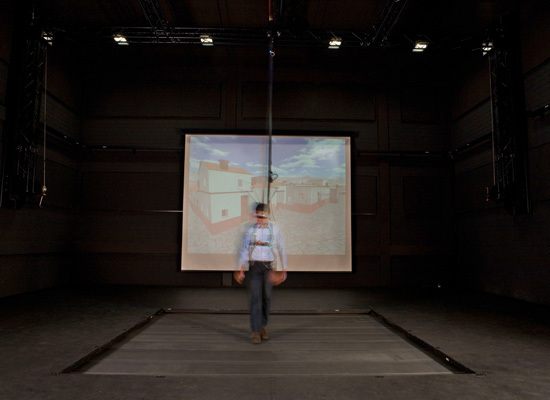 Developed by a consortium of several European research labs headquartered at the Max Planck Institute for Biological Cybernetics, it's “an omni-directional treadmill, which together with markerless tracking, optimized control and several perceptual tricks enables humans to walk through Virtual Worlds in a natural and unconstrained fashion.” It's the largest such platform in the world, we are told. You can see it, or rather the virtual explorer, in action here. For a much larger treadmill, cover the ribbon belts with turf, plant a few trees and some shrubs, screw in some decorative boulders and glue in a water feature. Introduce some fauna as well. Then turn on the machine, go for a stroll, and watch as this deterrestrialized earth rotationally reconfigures itself into myriad combinatorial landscapes. William Whyte is not unknown to us, and hasn't been for quite, quite sometime. "...and watch as this deterrestrialized earth rotationally reconfigures itself into myriad combinatorial landscapes." Really? This reads like a parody of earnest, insular academia. 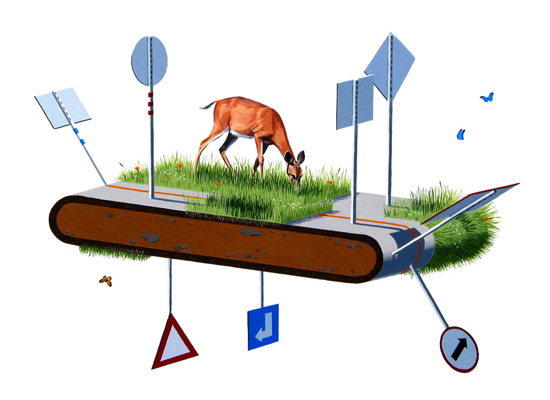 Also, what happens to that poor deer after the conveyor belt sends it plummeting? Each belt emits its own gravitational field.